Mix all ingredients, except rice, in a gallon size Ziploc freezer bag. Lay flat to freeze. Place rice in quart size Ziploc freezer bag. Lay flat to freeze. Thaw completely. Place all ingredients, except rice in slow cooker. Cook 6 hours on low or 2-3 hours on high. Cook rice. Serve over rice. 1. Place chicken, tomatoes and chilies in gallon size ziploc bag. 2. Place veggies in quart size ziploc bag. 3. Place spices in snack size bag. 4. Put three bags in a gallon size ziploc bag and freeze. 1. Completely thaw the three bags. 2. Spray slow cooker with non-stick cooking spray. 3. Place all ingredients in slow cooker and mix gently, until all spices are incorporated. Cook on low for 4-6 hours or high for 2 hours. 4. Serve with tortillas, shredded cheese, pico de gallo, and guacamole. Flake drained tuna. Add celery, onions, bread crumbs, relish, egg white and mustard to tuna. Mix well. Form into 4 round patties, 1/2" thick. Place in gallon-size Ziploc freezer bags. Freeze flat. Thaw completely. Heat griddle. Place muffins cut side down on pan and toast 1-2 minutes. Remove from pan. Set aside. Lightly spray patties with vegetable oil. Cook patties over medium heat for 6 minutes, carefully turning after 3 minutes. Top with cheese. Continue cooking 1-2 minutes, or until cheese is melted. Spread muffins with additional mayo or mustard, if desired. Top with lettuce and tomato and tuna patty. Pour meatballs and sauce into gallon-size Ziploc freezer bag. Freeze upright for easy placement of frozen food into crockpot. Place buns in 2 separate gallon-size Ziploc freezer bags. Freeze flat. Place cheese in quart-size Ziploc freezer bag. Freeze flat. Thaw meatball bag enough to release into slow cooker. Running under warm water for a few minutes does the trick. Cook on low for 4 hours. (If you'd rather not use slow cooker option, you can thaw contents and cook on stovetop until heated through.) Toast buns in oven. 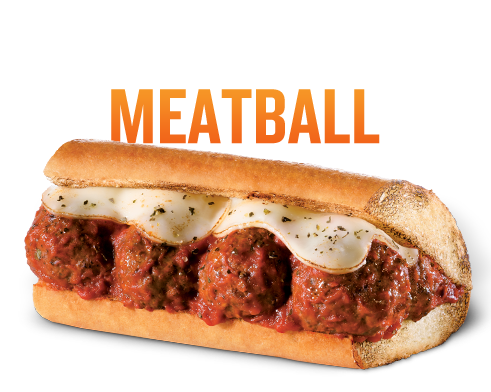 Place 4 meatballs and a small amount of sauce on each bun. Top with a slice of cheese. Broil 1-2 minutes until cheese melts. Enjoy! 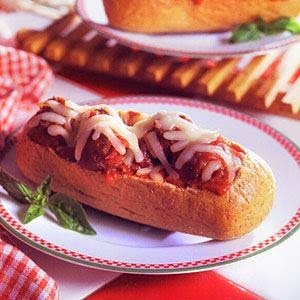 These are very good if you add a few slices of pepperoni to the top of each before adding cheese. I did not slice the deli buns, so that you would have the option of doing a regular sub or a boat. See pic of boat below. If you want to do a boat, you just need to cut into the top of the bun and scoop out some of the inside bread to hollow it out.